Did you ever get one of those tee shirts from your parents after their amazing vacation trip to Hawaii? Well, I had that same kind of feeling after opening my mail early this year. Yes, the IRS requires churches and other nonprofit organizations to provide a statement of giving to its donors each year. But your giving statement doesn’t have to look like it came from the pages of a legal handbook. Quite the contrary, this is yet another opportunity to connect giving to ministry impact! We should celebrate the wins and tell of the great things that are in place because of generous people. Your giving statements are another great opportunity for doing so. People support nonprofits because they sense the organization is making a difference. And they can sense that of your church too, if you tell people the difference you’re making. Good donor stewardship goes the extra mile. Of course it’s important to say “thank you,” upon receipt of a gift, but good stewardship links the gift to how it helped the organization make a difference. One of the first statements I received this year included a nice cover letter signed by the pastor of the church. 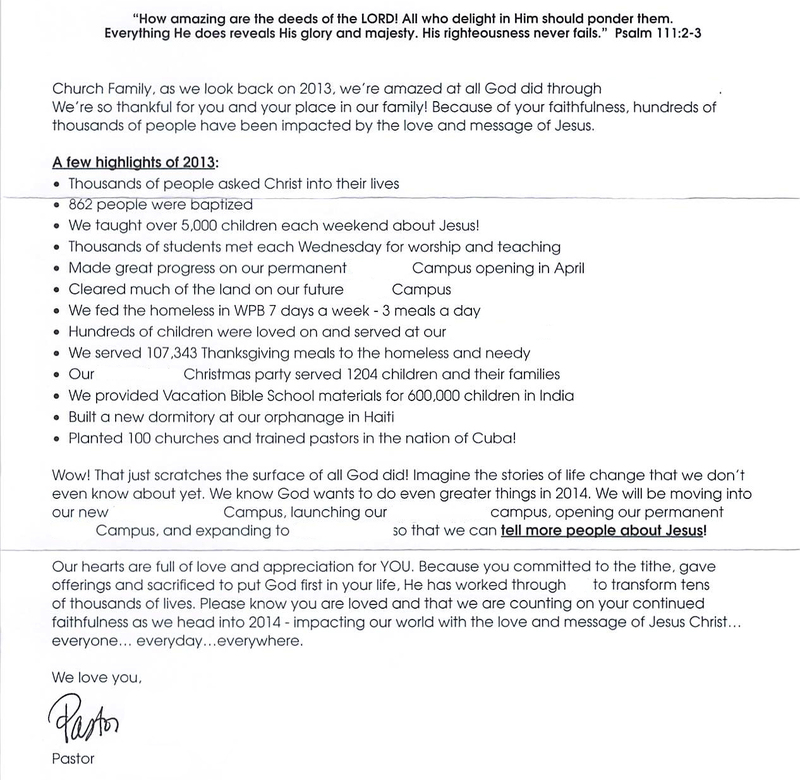 As you can see, there is a very easy-to-read bullet pointed list of ministry accomplishments in this letter. The pastor thanked me for my contribution, and also explained a few ministry goals for future years. Receiving this information only encourages me to continue giving in 2014. I know for sure they’re doing great things with my generosity! And then I got a card that really caught my eye. 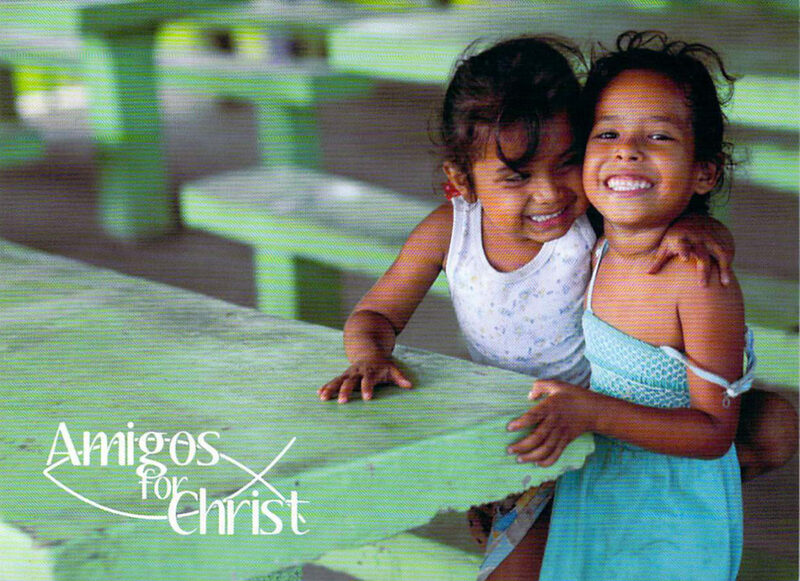 There was a photo of two adorable little children on the front, and the inside reminded me of this organization’s mission. 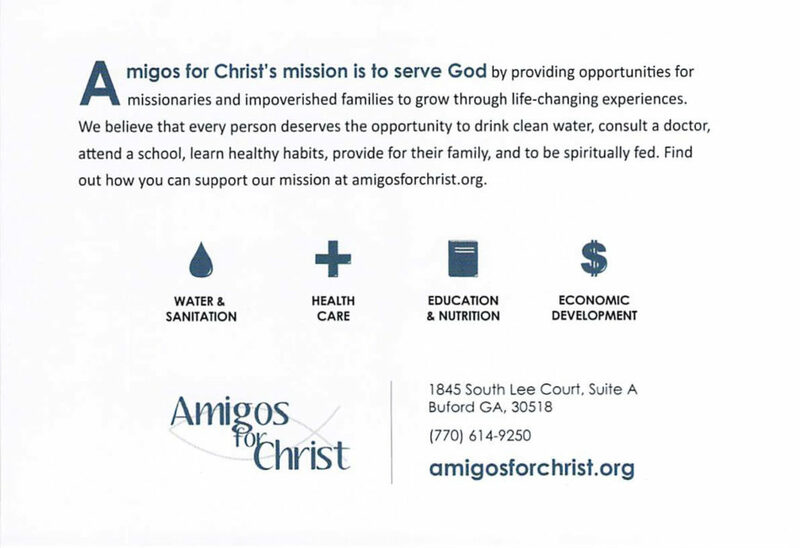 I was blessed to receive this card and the knowledge that I had something to do with a child in Nicaragua being able to drink uncontaminated water for the first time ever. Did you read that correctly? I was the one who felt blessed. 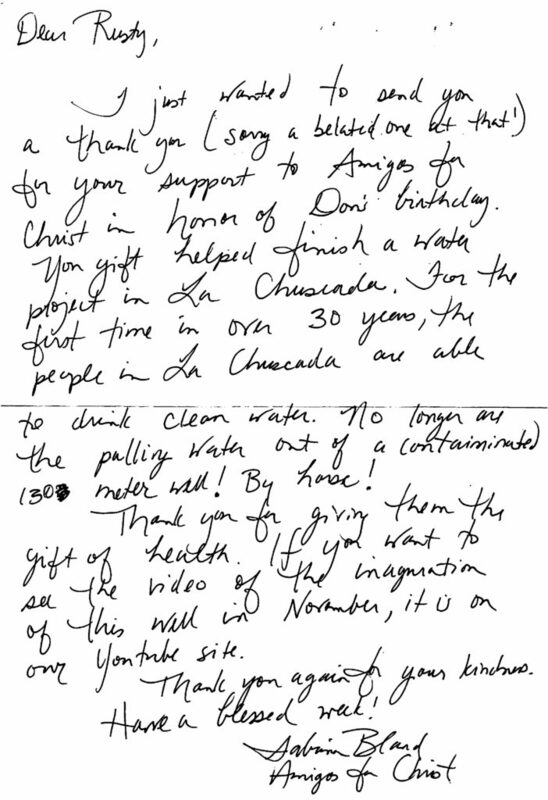 Without a doubt the people in La Chuscada have been blessed to receive clean water, but this reminded me that I have been blessed to be a blessing. Then I received a statement that looks more like a receipt of sales. Name and address at the top. A list of dates and gift amounts. There is nothing that shows the good that might have come from our contribution. Hmm. Well, I suppose I have what the IRS requires – paperwork that reflects our 2013 contribution – but that’s all we have. Let me ask you this, which organizations might receive our gift the next time we have money to share? Which organization would you remember first? Let me reiterate what I said above: People support nonprofits because they sense the organization is making a difference. Here’s the point. 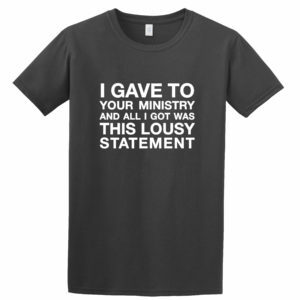 Make sure the cover letter that accompanies the giving statement links giving to ministry impact and life change – that’s the key! So, I challenge you to examine your giving statements and cover letters. Do they thank the giver for the gift? Do they share stories of ministry impact? Do they tell of future goals to encourage continued giving? I’d love to hear how your church uses giving statements to celebrate gifts of generosity and ministry wins! As a church leader, there’s nothing more frustrating than not having the funding to do what God’s calling you to do. But when you think about trying to address that problem, you feel overwhelmed, you dread the potential pushback from your congregation, and you’re not sure where to turn for help. Over the last 18 years, I’ve helped more than 120 churches close the gap between their current financial reality and what they need to move forward in ministry.